The Islamic Jihad is encouraging terror in Jenin, once known as the “the terror capital” of the PA, according to IDF spokesmen. Hamas is active in Tulkarm, a large Arab city only a few miles east of Netanya and overlooking the north-south superhighway known as Kvish 6. Jenin is located in central Samaria, a few miles south of the highway that connects the Mediterranean Coast with Hadera, Afula and the Jordan Valley city of Beit She’ an. “For the first time in a while, the Palestinian Islamic Jihad, one of the terror organizations dominant in Jenin, has been enabling terror attacks to originate from within the city,” the IDF reported. "We assume this is an attempt to prove better than other terror organizations after the attempted attacks from Gaza didn't prove successful," explained a reliable intelligence source to the IDF website. Military spokesmen added that the army and the Israel Security Agency (Shin Bet) have arrested an increasing number of terrorists in the city the past three months. The Palestinian Authority is committed to tear down the terrorist infrastructure in Jenin, Tulkarm and other major cities. Despite praise from the United States, it frequently refrains from arresting terrorists. The IDF also said there is a connection between the increased terrorist activity in Tulkarm and the release of terrorists late last year in exchange for the return of kidnapped soldier Gilad Shalit. 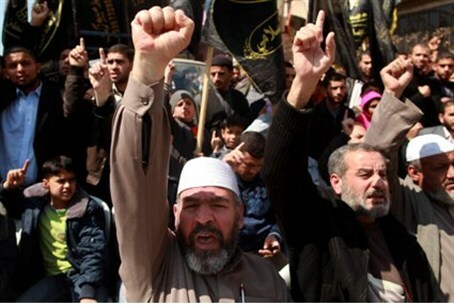 Hamas is focusing on incitement through the social-education work to increase terror. Leading U.S. Congressmen have noted that the Palestinian Authority is not living up to its commitment to stop incitement against Israel. Among the terrorist released for Shalit, at least 10 have been arrested for returning to terror, and many others still free are supporting the terrorist infrastructure, IDF spokesmen added. “In nearly every district, there have been several recorded cases of parole violations,” the IDF stated. Most of the released terrorists and security prisoners refused to agree not to return to terrorist activities. Yahya Sanwar, founder of the Hamas military wing and one of the kidnappers of Nachshon Wachsman who was murdered by the terrorists, announced on his release that "the Israeli prime minister is warned, we will continue our resistance, released prisoners will not stop working toward our liberation."